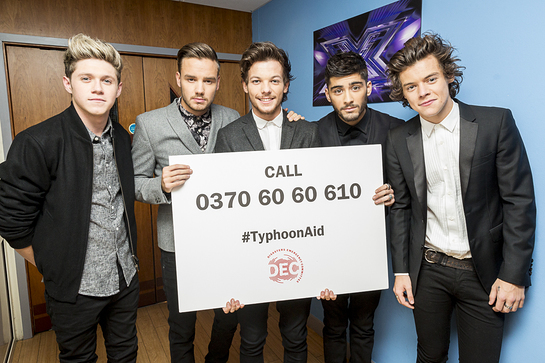 One Direction will tweet to kick off a celebrity telethon at BT Tower today where callers could have their donations taken by one of a host of celebrities. For the chance for their donation to be taken by a celebrity the public should call: 0370 6060610 between 4pm and 7pm today. From 4pm to 7pm today, Monday 18 November, a host of celebrities including Jamie Oliver, Andrew Marr, Radio 1’s Gemma Cairney, Alan Rickman, Downton Abbey’s Joanne Froggatt and Allen Leech, Lisa Snowdon, Nigel Havers, Nick Frost, Meg Mathews and comedian Stephen Merchant will be answering the phones at a fundraising telethon. The event will take place at London’s iconic BT Tower and will raise funds for the DEC Philippines Typhoon Appeal. The telethon will give donors the chance to have their donation taken by a famous voice on the other end of the phone. The Disasters Emergency Committee (DEC) is raising money to help the survivors of last week’s typhoon, which ripped through the Philippines, devastating the lives of over 11 million people. Typhoon Haiyan, which raised a storm the size of Germany, flattened homes, schools and hospitals and destroyed food and water supplies. Thanks to public donations the DEC appeal raised £23 million in the first 48 hours, and has now reached £35 million. This money is critical to getting food to the 2.5 million people who are hungry, and shelter to the 900,000 people who have been driven from their homes. Stay up to date with developments in the Philippines, the emergency response and the DEC’s fundraising efforts on Twitter or on Facebook.